The Police Service of Northern Ireland (PSNI) has launched a new recruitment campaign, with a number of changes in the process aimed at attracting more Catholics and women. New recruits will no longer have to pass a strength test, and can complete a selection test online instead of having to go to an exam centre. 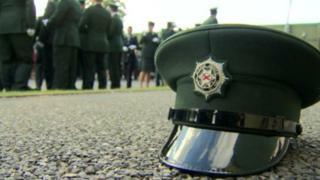 The PSNI's aim is for 50% of officers to be Catholic, the figure is currently 31%. The figure for women is 29%. They hope to recruit 300 new officers. This is the first recruitment process since September 2015, and the first since an independent report commissioned to identify reasons behind the reluctance of Catholics to apply to join the PSNI. The report by Deloitte - Understanding Barriers Affecting Police Officer Recruitment - found that many Catholics wanted to keep their application secret and dropped out because they did not want to attend an exam centre in an unfamiliar setting. Dep Ch Con Drew Harris said he was hopeful the introduction of online tests would encourage more Catholics to apply. "We found that was a significant chill factor, the attendance at an exam centre, for Catholic applicants," he said. "Far more Catholics dropped out at that stage than Protestants." Image caption Dep Ch Con Drew Harris is hopeful the introduction of online tests will encourage more Catholics to apply. It is also the first recruitment process since the PSNI removed the need for recruits to pass a "push and pull" strength test as part of their physical competency assessment. In previous recruitment drives, only two out of every 10 female applicants passed the strength test, compared to 90% of men. The test will still be part of the physical assessment, but there is no longer a requirement to pass. In addition to targeting more Catholics and women, the PSNI said it also wants to increase the number of new recruits aged between 18 and 24 years, and from west of the Bann. Despite the ongoing threat from dissident republicans, the police said they are confident they will attract a large number of applications from all sections of the community. In the last recruitment process, 5,498 people applied. "We're confident we will get the numbers, what we want to be clear about is how representative we are," Mr Harris said. When the recruitment process is completed, the PSNI will have 6,700 officers.